The Plight of Greek Pensioners? 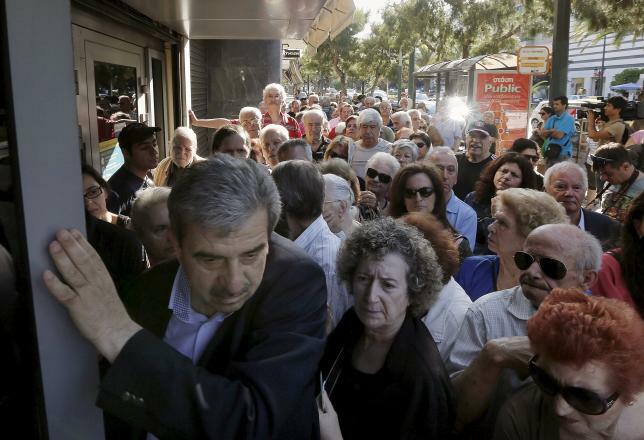 Long lines of pensioners jostling to get into a limited number of banks opened specially to pay out retirement benefits have become a powerful symbol of the misery facing Greece and the problems mounting for Prime Minister Alexis Tsipras. With banks closed down and capital controls imposed to shield the financial system from collapse, the depth of the problems facing the country has become clearer each day. Tsipras' leftwing government came to power in January vowing to protect pensioners and much of the breakdown in relations with international creditors centered on its refusal to accept the cuts in pensions that the lenders demanded. Mindful of the fact that many older Greeks do not use credit or debit cards and so do not have access to cash machines, it has ordered 1,000 banks to open across the country to pay out a maximum of 120 euros and issue cards. But in the process it has created a compelling reminder of the costs its confrontation with the lenders is inflicting on a society already deeply scarred by more than five years of harsh austerity imposed under successive bailout accords. "In line for a handful of euros," the conservative Eleftheros Typos newspaper headlined on Thursday. "The dignity promised by Tsipras turns into humiliation for thousands of pensioners". In a country where one in four of the workforce is without a job, the plight of the pensioners, whose monthly benefits can often be the only source of income for families, is an acutely sensitive issue. Konstantinos Nikolopoulos, a 70-year-old former employee of U.S. entertainment group Warner Bros, emerged from his bank empty-handed after being told that benefits from his pension fund were not being paid out. "They told me they don't know when they will have the money and asked me to come again tomorrow just in case," he said. "This situation is out of control." With scenes of long bank queues being played continuously on Greek television, the issue creates a big risk for Tsipras ahead of Sunday's referendum on Greece's bailout terms, now widely seen as a decisive test on the country's future in the euro. The only major opinion poll published on the referendum showed support for the "No" vote recommended by Tsipras slipping since the introduction of bank controls this week, although the depth of resentment against bailout-imposed austerity makes the outcome very hard to predict. "On Sunday, I am slightly confused," said Nikolopoulos. "I believe the message should be that the Greek people has to take a decision to settle its debt with a fair compromise, I am leaning more to voting 'No'." The government side is however keenly aware of the damage the headlines and continuous television broadcasts are creating for its image. The left-leaning Efimerida ton Syntakton newspaper, which is sympathetic to the ruling Syriza party, reflected the concern on Thursday, blaming the TV stations for deliberately seeking to stoke the climate of fear in the country. It showed the TV broadcasts alongside German Chancellor Angela Merkel and her Finance Minister Wolfgang Schaeuble, IMF head Christine Lagarde and others seen as villains by the left in a graphic headlined: "The mechanism of terror". The left-leaning Efimerida ton Syntakton newspaper is worried because if the YES side wins the vote on Sunday, it spells the end for SYRIZA and its funding. Greek newspapers and other media outlets are notoriously corrupt, routinely blackmailing businesspeople and politicians to get funding or their loans excused. I typically don't trust anything they say but in this case, you have to be blind and deaf not to see the horror going on in the streets of Greece. I've been glued to Greek television all week, especially the last couple of days. Admittedly, it's hard not to get addicted to Greek television these days even though all they do is scream at each other at the top of their lungs. Unlike civilized and boring Canadian television debates, however, they have great shows where politicians and journalists rip into each other and even shows where normal citizens get to rip into elected ministers. Greeks argue with passion. And these shows cover all the angles. Everyone has a voice except for the neo-Nazi Golden Dawn party which is rightly marginalized and ignored by the media. I grit my teeth whenever SYRIZA members spew their lies. I typically switch the channel whenever some guy or gal from the KKE communist party talks because their views are from planet Mars and useless as far as I'm concerned. The two politicians I love listening to are Kyriakos Mitsotakis and Makis Voridis from New Democracy. Voridis makes Canada's NDP leader, Tom Mulcair, look like a puppy dog when he goes for the jugular of SYRIZA members. At his best, he's vicious, meticulous and ruthless exposing the lies SYRIZA's members are spreading. But there are other excellent politicians in Greece. Greeks may not like him much but the former finance minister and former leader of PASOK, Evangelos Venizelos, is a constitutional lawyer with an incredible intellect and equally devastating when debating SYRIZA members (except he uses raw intellect and a vastly richer vocabulary than anyone else). I also like the leader of To POTAMI (The River party), Stavros Theodorakis, and he may be the right person to lead a new coalition government out of this mess. His views are more balanced and he has been urging the Greek PM to call off the referendum. But a defiant Alexis Tsipras isn't calling off the referendum even though the country's economy just suffered a massive stroke. Citing an IMF report, he said the nation’s debt will need to be cut by 30 percent, with a 20-year grace period for payment, in order to be sustainable. That's all fine and dandy but he should have thought of this a lot earlier. Without banks, the central nervous system of any economy, nothing is moving in Greece. The Greek private sector is at a virtual standstill. Employees are being sent on a "forced holiday" and if banks don't open, many businesses will go bankrupt and unemployment will surge to disastrous levels. SYRIZA's leaders are going on television stating the "ECB and creditors are to blame for bank closures as they want to meddle in Greek politics and scare people into voting yes." But the truth is the Greek government closed the banks, right after Varoufakis stated they will remain open. In fact, Yanis Varoufakis, Greece's "rock star" finance minister has been exposed as a hopelessly narcissistic blatant liar. Last Friday, just hours before Alexis Tsipras announced a referendum, Varoufakis stated "there will be no referendum" on Greek television. Varoufakis is now stating there will be "no bail-in", meaning there will be no haircuts on Greek deposits at the banks and "no return to the drachma". How can Greeks trust this guy or any of SYRIZA's leaders? They have all been exposed as incompetent, dangerous and delusional fools who are willing to commit economic suicide, foolishly thinking the other side will blink first. As I feared, Varoufakis and Tsipras have yet to blink but neither has the other side. In particular, Germany called Tsipras's bluff. Merkel and the rest of the eurozone leaders are telling the Greek government there will be no talks until the results of the referendum are known. Quite worrisome, the vote is too close to call now but there are quite a few undecided voters and I take all these polls with a grain of salt and believe after a chaotic week, most Greeks, especially the older generation fed up with SYRIZA's lies will resoundingly vote Yes. At least I hope so. Because the truth is the plight of Greek pensioners and many other Greeks -- including public sector workers who think their jobs, wages and pensions are safe under this government -- will get a lot worse unless they vote Yes to the eurozone, forcing the current government to resign. At least Varoufakis has the courage to publicly state he will resign if the Yes vote wins. He should have resigned a long time ago and if he truly had his country's best interests at heart now, not his party's twisted and bankrupt ideology, he would urge Alexis Tsipras to call off the referendum and step down as soon as possible. Instead, Greece's finance minister told the BBC's Katya Adler that "maybe things have to get far worse before they get better" but he said he was confident agreement would be reached - whether Greeks voted yes or no (he's right on one front, things will get much worse no matter who wins Sunday). Other SYRIZA leaders will be hard pressed not to follow Varoufakis and resign if the yes vote wins. Some are delusional, publicly stating they will endorse the will of the people and "negotiate with their European partners" who they've been publicly trashing on Greek television. The devastation going on in the Greek economy right now is unprecedented. The Wall Street Journal published a great article on how the cash crunch is hitting every day life in Greece. It's even worse than the article states. There are many neighborhoods in Greece right now that look like ghost towns. People are glued to their television sets and only go out to shop for the bare necessities (the 60 euros a day withdrawal limit is more like 50 euros as many banks do not have 20 bills). There are Greek students studying abroad who cannot receive money from their parents to survive. There are Greek medical tourists in Italy right now who cannot pay their medical bills. There are big and small businesses who cannot pay their suppliers to import food and other much needed supplies. There are ambulances in northern Greece that ran out of gas. Hotel owners cannot buy food and beverages for their customers and are now demanding cash as the only form of payment fearing they won't be paid from bank if they accept credit cards. Many Greek islands are now suffering from gas shortages and tourism both from Greeks and foreigners has plunged as many are cancelling their vacation plans fearing the worst. Greek professionals are scrambling to leave the country as the economic situation deteriorates, flooding the inboxes of diaspora Greeks across the world with resumes and requests for jobs. In short, every day that banks are closed, the Greek economy sinks further into the abyss and closer to total collapse. Varoufakis and company didn't factor this is into their equation as they arrogantly played their "Great Game" because they simply do not understand how a market economy works or couldn't care less of the plight of their fellow citizens. Closing the banks effectively means blowing up your economy. And the irony is that while Varoufakis continues to lament against harsh austerity measures, urging Greeks to vote No, his government has succeeded in implementing the harshest austerity ever, a total and utter economic collapse. As far as the creditors are concerned, they need to wake up and take responsibility for this chaos too. They turned a crisis into a calamity. Ambrose-Evans Pritchard is right, Europe has suffered a reputational catastrophe in Greece, but he's wrong to blame the ECB for this latest turn of events. The vast majority of Greeks want to stay in the EU. In an ideal world, offering financial aid in exchange for reforms might help those in the country who want to shape it into a modern European state. But given the difficulty Greece has had so far in making the necessary changes to reach that goal, it might be time to reconsider this approach to the crisis completely. In place of a program providing the country with further loans, it might make more sense to provide outright humanitarian aid – regardless of whether Greece remains fully within the eurozone. The way things are going, Greece will soon need a lot of humanitarian aid. Even if the Yes vote wins, which is likely but far from certain, banks won't open anytime soon until another deal is struck. If the No side wins, the Greek economy will collapse and I fear Armageddon, riots and social unrest. I'm taking Friday off as it's 4th of July weekend and being a proud Greek-Canadian, I don't typically blog when U.S. markets are closed (I only invest in and trade U.S. stocks). Please remember to contribute to my blog using the donation or subscription options on the top right-hand side. Thank you and I wish all Americans a great long weekend. 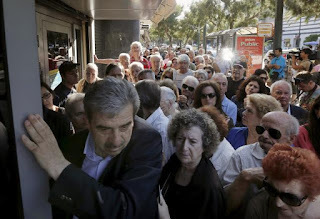 Below, anxious crowds of Greeks on Wednesday thronged banks that were opened especially for pensioners who don't have bank cards, to allow them some access to their money. Some had been waiting since the early hours of the morning, but as the opening hour approached, tensions rippled through the crowd. I hope Greek pensioners realize this is their future if they vote No on Sunday. I hope Greeks realize a No vote won't lead to a better deal, just Grexit and catastrophe. I also hope European politicians are ashamed of these images and realize the devastating consequences of imposing harsh and asinine austerity measures which have disproportionately hurt the Greek private sector, killing growth. But most of all, I hope Greek Prime Minister Alexis Tsipras does the right thing and resigns on Monday, especially if the Yes vote wins. Greek pensioners and all Greeks have suffered enough. The End of Private Equity Superheroes? An Ominous Sign From Commodities? Bridgewater Turns Bearish on China? A Tale Of Two Markets? The Bank of Canada Stumped? The Trillion Dollar State Funding Gap? Curtailing Lump Sum Pension Payouts? Did Greece Just Cave To Creditors? China's Pension Fund To The Rescue?